Atlanta, Ga. May 19. 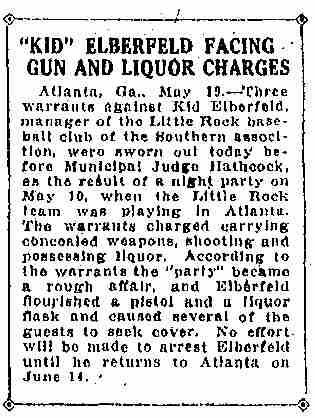 - Three warrants against Kid Elberfeld, manager of the Little Rock baseball club of the Southern Association, were sworn out today before Municipal Judge Hathcock, as the result of a night, party on May 10, when the Little Rock team was playing in Atlanta. The warrants charged carrying concealed weapons, shooting and possessing liquor. According to the warrants the "party" became a rough affair, and Elberfeldflourished a pistol and a liquor flask and caused several of the guests to seek cover, No effort will be made to arrest Elberfeld until he returns to Atlanta on June 14.